The device shown above is smaller than your finger and it might be the future of devices to treat a fractured spine, pinched nerve, or neurological disorder like epilepsy. Oh…did I mention that it was implantable!? A team of engineers and medical researchers in Sweden has just designed a pinpoint-accurate implantable drug pump. It delivers medicine with such precision that it requires only 1 percent of the drugs doctors would otherwise need to deploy. 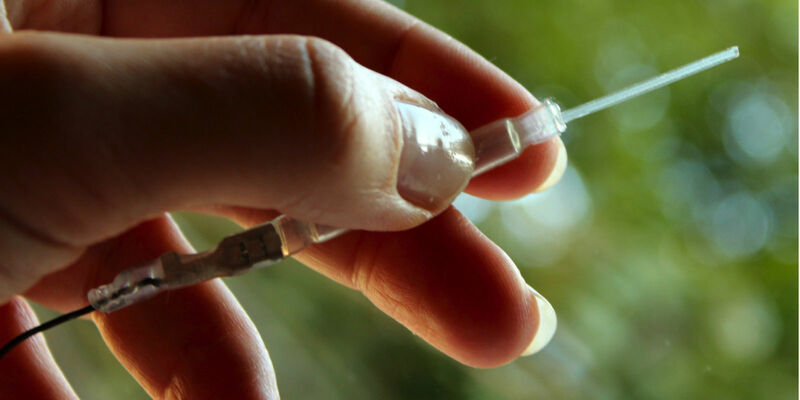 As it demonstrated in tests on seven rats, the tiny pump can attach directly to the spine (at the root of a nerve) and inject its medicine molecule by molecule. The technology is based on a compact but complicated piece of laboratory equipment called an ion pump. To put it simply, as electric current enters the ion pump one electron at a time, medicine is flung out the other end one molecule at a time. One caveat: Because of this setup, only medicines that can be electrically charged can be used with the pump. But that includes more pain medicines than you might think, including morphine and other opiates. In their study, Jonsson and her colleagues experimented with gamma-aminobutyric acid (GABA). This chemical essentially puts the brakes on nerves, reducing pain, but it stops being produced where the nerves are broken. Jonsson’s approach was to use her new drug pump to simply put more GABA back into the broken part of the spine. With any other drug pump this would be ineffective if not insane—the GABA would simply travel throughout the spine at leisure, wreaking widespread havoc and disrupting the nervous system. But, with the ion pump’s pinpoint precision, Jonsson could inject incredibly small amount of GABA right where they needed it, without the risk of major damage. And it worked. When the scientists gave the test rats a common pain-response test (essentially poking their paws, and seeing how much force was needed for them to retract their arms) the rats with drug-pumps could on average withstand 5 times more force. Jonsson is emphatic that her medical device is still in the research phase, and a real ion drug pump may be years away. Scaling up the pump to the size required for human needs might not be too big of an issue, but for this experiment, the researchers had their rats implanted with the pumps for three days only. The shell of the pump would likely need to be changed for longer-term use, she says. Regardless, drug pumps like Jonsson’s may hold the promise of future biomedical devices designed to assuage nerve pain and treat neurological diseases.